Gwen Miller’s commitment to her students is simple. She’s going to give you the means to enjoy the game of golf and be the best player you want to be. Each student is an individual with varying goals and needs. Whether you're a beginner, experienced player or someone with goals beyond the amateur enjoyment, there is a lesson plan designed specifically for you. the Gwen Miller Golf Academy is second to none. The three day, two day or one day programs are designed to meet a variety of needs. 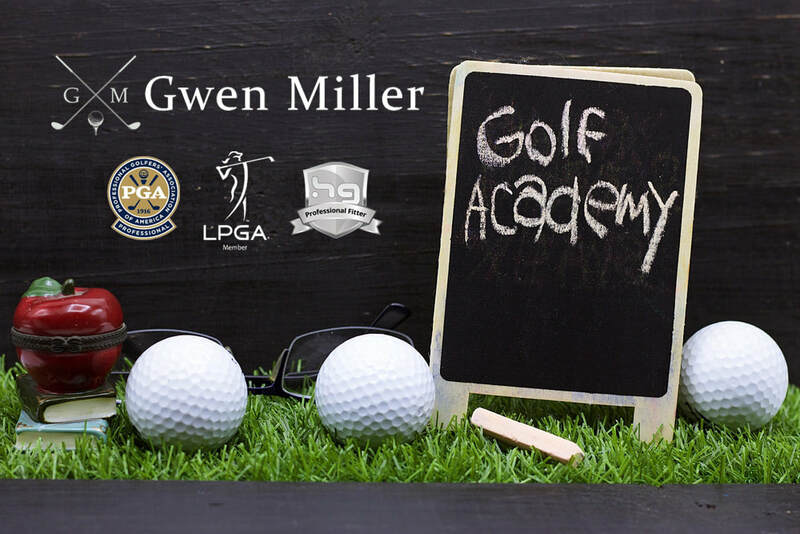 Gwen Miller will get to the root of your problem and you will have a cognitive understanding of what you need to do to achieve your long term golfing goals. She will not give you a band aid. You will learn in a relaxed, intimate atmosphere at a pace designed for you. Private lesson programs are designed with the same individuality in mind. A variety of packages are available, one on one, or a small group of two or three individuals. If you're looking for equipment advice, my credentials as a Certified Master Teacher Clubfitter through Henry-Griffitts allows me to precisely address all your needs. Using the HG Total Test™ system, the correct combination of all golf club equipment can be tested, resulting in the most enjoyable and precise experience a student can have. • Director of Wild Wing School of Golf 2001-2006. • Ranks in the Top 10 Nationally Of Certified Master Clubfitters through Henry-Griffitts, Inc.
• Four-Time Nominee for Carolinas PGA Section, Teacher of the Year Award 1998-2001, 2002, 2003. • Golf for Women Magazine's Top 50 Teacher Nominee 2001. • Coordinator of "Ladies Only" Program, Wild Wing Plantation. • Certified Instructor for Peter Crocker "Path to Better Golf" Schools. • Coordinator for various Myrtle Beach area Junior Golf programs and schools. • One of 40 worldwide Certified Master Clubfitters for ​Henry-Griffitts, Inc. I just wanted to thank you for the great experience we had last week. It is truly a pleasure working with someone with such expertise, patience, and attitude." She has the special ability to recognize the golfer's problems and to clearly teach her student to overcome those problems so they can maximize their ability.